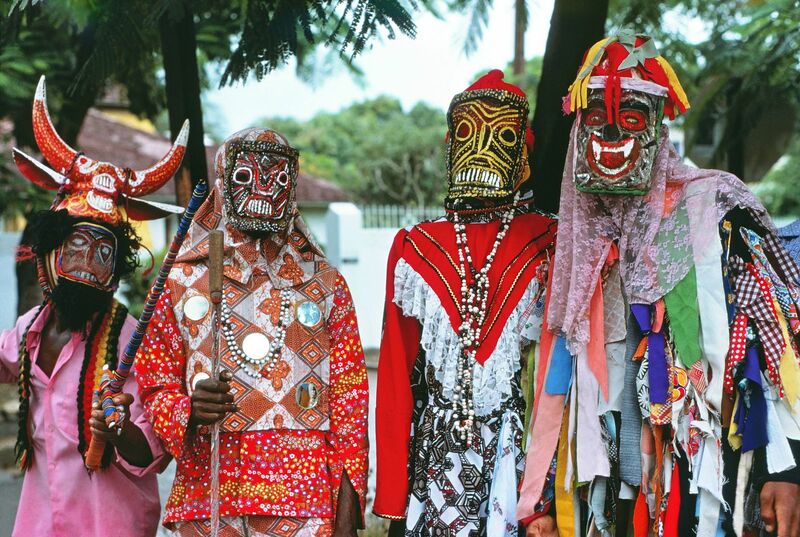 John Canoe is mainly a Jamaican traditional band of masqueraders who appear in towns or villages during the Christmas season. It has other variations in spelling such as, ‘Junkanoo’ or ‘Jonkonnu’, or is typically referred to as ‘muskorate’ (meaning ‘masquerade’). There are still uncertainties regarding the origins of the name ‘John Canoe’, however some are of the opinion that the name is derived from the French word ‘inconnu’. ‘Inconnu’ means ‘unknown’ and would point to the essential feature of wearing of masks during the John Canoe proceedings. John Canoe is very popular in Portland, Westmoreland, and St. Thomas. A tradition of John Canoe has existed in England and in many European countries. New World Countries of Latin traditions celebrate John Canoe carnival activities of various types. Traces of a direct continuation of this tradition can also be seen in carnivals of Rio de Janiero, New Orleans, Trinidad, and The Bahamas. 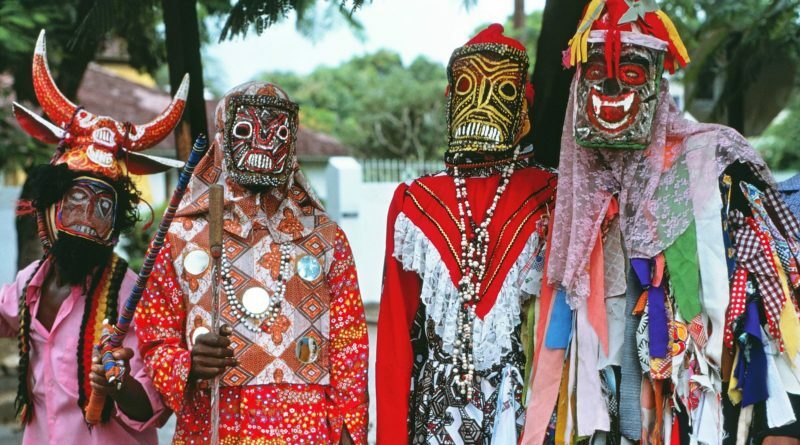 The Jamaican celebrations of John Canoe took the form of masked dancing, acting, processions, and revelry at Christmas time. The tradition dates back to hundreds of years and was widely indulged by the slaves as part of their principal holiday celebration. The bands became very large and elaborate, setting the mark as a Christmas carnival. In the 18th century John Canoe was at its peak in Jamaica. The bands were first encouraged, then, out of fear, they were suppressed by the authorities who wanted to dismiss the possibility of slave uprisings. In general authorities at that time wanted to discourage gatherings of blacks, use of drums, blowing of horns, and conch shells. These elements were often used as a means of communication for the slaves. After Emancipation of the slaves in 1838, John Canoe suffered further decline. Non-conformist missionaries attempted to stamp out pagan amusements and rituals among their converts. The civic authorities were also in opposition of the tradition, which resulted in the most serious civil disorder in the years immediately afterEmancipation. This riot was labeled the ‘John Canoe Riots’ of 1841, which resulted when the Mayor of Kingston banned the John Canoe Parade. In the ensuing clash between angry revelers in the city and the Militia, the Mayor was forced to take refuge on a ship in the harbor. As years passed, some folks in society saw John Canoe dances as debased, vulgar, and frightening to children. As a result self-appointed persons continued to actively discourage their appearance. There were also frequent clashes between the bands the police, which led to John Cane being only seen in deep rural communities. In addition, at some point band members started to collect money for their entertainment, and collecting money became more important than parading and acting. There a renewed interest in John Canoe which was sparked from a sponsorship by the Daily Gleaner in 1951. 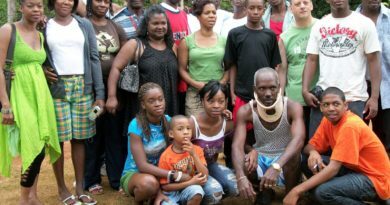 The Gleaner Company sponsored a John Canoe competition and the degree of participation indicated that old-timers had indeed kept the tradition alive. Over the years, the John Canoe tradition has significantly died out and is hardly seen today, except for performances at some organized social events. It is however seen as an important aspect of our culture and heritage. 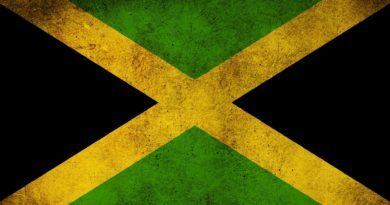 It is kept alive today mainly through government-sponsored events such as the Jamaica festival. In some country villages, towns and sections of Kingston a few dancers and musicians still come out at Christmas time. These dances seek permission from the police and does their John Canoe play to the infectious rhythm of the typical John Canoe music. The essence of the John Canoe masquerade is the disguise of the players, but recognition by the public of the characters whom they represent. All players in Jamaican John Canoe wear masks. This is a novel kind of mask, made of very fine mesh-wire, with features painted onto it in color. This enables the wearer to breathe during the strenuous exertions. All players are clad in costume, and to the best of traditional knowledge all players used to be men. John Canoe costumes were brightly colored and were decked with red, yellow, blue and green ribbons, with head-dresses of wire and colored paper. Cow horns or horses’ skulls were used for the appropriate characters. The King and Queen wore costumes of shiny materials and crowns of cardboard covered with silver paper. The Queen was generally dressed in white, with a veil of white tulle completely covering her face. There could be also one-legged men, still dances and contortionists. Jack-in-the green, a man covered with green foliage, seems to be an old character not found very much nowadays in John Canoe. In the east (St. Thomas) and far west of the island (Hanover) there was another character, Mother Lundi, an enormous, gaudily dressed, effigy of a woman, constructed on a framework of bamboo-wicker and borne on a stick. This character was made to wheel and turn and bob by the skill of the dancer concealed underneath. Another set of characters that seemed to have its origin in the Eastern part of the island, in St. Thomas and Portland, were the Indians -American Indian types- dressed with beads and mirrors, and wearing feathered head-dresses. 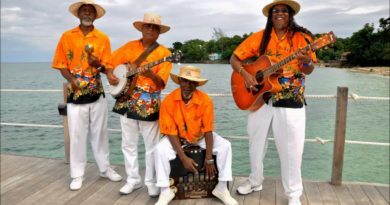 The John Canoe band have always included a musical band consisting of one or more drums, a bamboo fife and other blowing instruments, such as a cow horn or a conch shell, and often a grater scraped with a fork. Stringed instruments like the guitar or banjo were almost never used in this type of band. In some parts of the island, a tambourine is used, not only for shaking but with two fingers rubbed across the surface of the skin in order to produce a groaning sound. The shapes of the drums used vary from place to place; some like the ‘kumina’ drums of St. Thomas, made out of hollow tree trunks, are sat upon stride and beaten with two sticks like the old military kettle drums. The flat board kete drum is hardly ever used today. Instead, there are the round tumba drums made out of tree trunks, held standing upright between the legs and beaten with two hands. There are also those of the tabor variety, slung around the shoulder and beaten with the hands only at one side, and large bass type, held in front of the body and beaten with two sticks. Sometimes there is the old, square-shaped, footed gumbay drum. Most bands have at least two drums, one to keep the basic rhythm, and the other, of higher tone, to make the cutting or exciting intricacies. The John Canoe dance was seen most often as a variant of a jig or horn-pipe. This does not mean that it was entirely European in origin or in style, by any means, but this is the easiest way to describe it. The chief steps were a quick step and hop on one foot then on the other, moving continuous shifting of the weight from back foot to the front foot, in a type of vibrating action which could be likened to a rapid open coupe in fourth position, done with bent knees. Turns were quick spins on one foot, followed by sudden stops with feet apart sideways with the hips sharply forward and with arms out to the side. Another turn was executed with one foot remaining in the center of an imaginary circle, while the other quickly described the circumference, by alternate lit and placing in a new position, with knees bent and straightened, alternately, with the body inclined at an angle towards the center of the circle. Very often, dancers would pause in front of each other and do a rotary pelvic movements ending with the sudden stop. Some often would leave the group and dance alone before the people watching. These steps were general for the whole group. Devil made fairly quick vibrating steps, followed by long quick turns, with sharp jabs of his pitch fork. Pitchy-patchy also did quick steps sideways from foot to foot, which caused his costume of brightly colored rags and tatters to tremble. He also jumped and spun in the air and turned cartwheels. Indian chiefs moved with long steps and menacing actions. They also danced the jig step, using hatchets and bows and arrows in exciting gestures. Cow Head did characteristic motions of ‘bucking’ with his body bent low. Horse Head, while the players/dancers own head is not seen, galloped and kicked like a real horse. The significance of John Canoe in Jamaican culture lies in its link with universal symbolism. Also, it lies in the fact that there is an overlay of Jamaican music, dance and rhythms motions, and an amalgamation of European, British, and African ideas.